While not a Doncastrian until after his football playing career was virtually over (he did in the odd emergency, play for Rovers), his popularity and success at Belle Vue awards him as an honorary favourite Doncaster son. The diminutive yet fiery Scot was born in Stirling on 9th December 1942 and was scouted by Leeds United at the age of 17 and going on to make 587 appearances and scoring 90 goals for the Elland Road club. He became their tough-tackling captain and was voted their Greatest Player of All Time. A statue to him exists outside Elland Road in Leeds. In the 1974 Charity Shield at Wembley he and Liverpool's Kevin Keegan were centre-stage in a foul-laden match seen on television. They exchanged punches and, rightly, were sent off. They both petulantly threw away their shirts and both were banned for 11 games. He made 54 caps for Scotland and moved on to Hull City before hanging up his boots and becoming Doncaster Rovers in 1978. He made 5 appearances as player manager for them over the next 3 seasons, and then concentrated on managing them until 1985 and Leeds Utd came calling. Under his management, Doncaster Rovers Football Club managed promotion to the Third Division in 1981 where they remained for two seasons before being relegated in 1983. The following year Bremner again lead them to promotion before returning to his first club Leeds as manager. Bremner was sacked by Leeds in September 1988 to make way for Howard Wilkinson and in July 1989 Bremner was welcomed back to Doncaster as manager again. 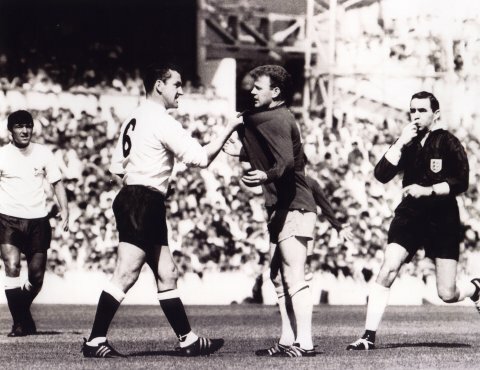 He succeeded Dave Mackay with whom he had a famous on-field bust-up (right). He staved off relegation to the Conference in his first season in charge before a major improvement in the 1990�91 season, in which Rovers were promotion contenders for much of the season before finishing 11th. He left Doncaster the following season, in November 1991. At the beginning of December 1997, he was rushed to Doncaster Royal Infirmary after suffering from pneumonia, but suffered a suspected heart attack at his Doncaster home in the small village of Clifton, South Yorkshire and died two days before his 55th birthday. Just about every major figure from Scottish football, past and present, attended his funeral in Edlington and there was citywide mourning in Leeds due to the extremely high esteem in which he is held by Leeds United fans.